The CrossFit Craze: Should You Try It? Picture this: Monkey bars and gymnastic rings hang from the ceiling and a bunch of weighted balls, Olympic-style barbells and various sized metal boxes are spread out on the floor. Eminem’s “Till I Collapse” is blaring through the speakers while a coach calls out commands to a diverse group of very sweaty participants who are currently performing their WOD (workout of the day). There’s a grandmother swinging what looks like a cast iron ball back and forth, a mom in her early 40s repeatedly hoisting a weighted bar over her head, and in the back, a 50-something man is squatting and flipping an oversized tire across the floor. 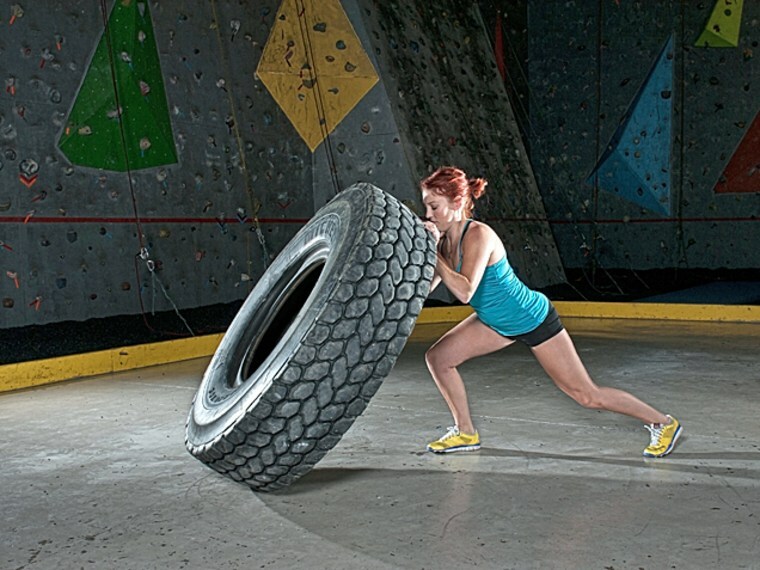 No, this isn’t a strongman competition; it’s just another CrossFit workout. Developed by coach Greg Glassman several decades ago, CrossFit is much more than a high-intensity workout—it’s a worldwide brand that offers training seminars, has more than 4,500 CrossFit locations worldwide (known as boxes) and even has a pretty sweet endorsement deal from Reebok.” CrossFit’s specialty is actually “not specializing,” so while CrossFit coaches may scale intensity and weight recommendations for participants, the structure of the workout is the same for everyone, whether you're a 60-year old grandmother or a 20-something athlete. With roots in both power lifting and gymnastics, CrossFit’s training methodology focuses on improving individual fitness levels for a broad range of participants. Anyone of any ability can partake, explains Alfonso Moretti, a certified personal trainer, CrossFit Level 1 Trainer and brand ambassador for Reebok. “All CrossFit movements are functional and fundamental, and strengthen the body wholly and completely. I encourage everyone to find a qualified CrossFit box or trainer. In my opinion, the CrossFit program should be used by everyone who takes his or her health and fitness regime seriously,” he says. A sample CrossFit WOD might consist of 50 box jumps on a 24-inch box, 50 jumping pull-ups, 50 walking lunge steps, 50 sit ups and a 15-foot rope climb (5 ascents). Sound tough? That’s because it is. Who is CrossFit right for? The claim is that CrossFit is appropriate for everyone, but it may not be the best fit for you. If you're okay with a no-frills environment, thrive on a little friendly competition and don’t mind working out really hard, then CrossFit could be for you. Just be prepared to fork over some cash—most boxes charge membership fees starting at $150 a month, which is not cheap compared to the national gym membership average of $40 a month. And for $40 you typically get perks like access to a larger selection of equipment, fully equipped locker rooms, towels, a variety of fitness classes. While it may not be cheap, CrossFit enthusiasts say it’s worth the investment. “I love CrossFit because of the way it has completely transformed and shaped my body,” says Stephanie El-Hage, a CrossFit devotee and full-time college student. “It's given me confidence in myself, helped with my depression and has made me more of an honest person. It's also given me a sense of community and a second family that I can turn to when I need help. I can always count on them,” she says. Not everyone likes the Spartan-style atmosphere of CrossFit, though. “My roommate and her boyfriend were really into it, so I decided to give it a go,” says Rose Bozzuto. It didn't go well—she felt like she was “going to die” during her first CrossFit experience. “I did not enjoy it as it was not a fun workout for me. It reminded me of high school gym [class], yet much more intense. Afterwards, I felt like throwing up. I like my fitness to make me feel worked out, yet energized and happy; not absolutely spent, which is how I felt after CrossFit,” she says. Perhaps the biggest factor to consider when it comes to whether or not CrossFit is for you is safety. “All forms of exercise pose risk, but the injury risk of CrossFit exercises is much higher than traditional forms of exercise,” explains Nicole Nichols, a certified personal trainer and fitness expert for SparkPeople.com. “CrossFit trainers and enthusiasts often say that when you do the exercises properly and work underneath a good trainer, you're safe and not likely to injure yourself. But lifting very heavy weights, where the goal is to meet a standard that is based solely on gender and not the individual, increases risk of injury exponentially," says Nichols. Some fitness professionals even question the methodology behind CrossFit. “Crossfit has merit, but is sometimes ridiculous and random. The intensity of the workouts will make you lose fat, but the lack of programming and random fitness challenges sometimes seem outlandish and like the exercises and reps were just pulled out of a hat. Am I a fan? Not completely,” says Jon-Erik Kawamoto, a certified strength and conditioning coach and personal trainer. CrossFit trainer Moretti disagrees. "You won’t find a fitness program that rivals CrossFit’s completeness or balance. Detractors will say that it’s simply cross training, others will say it’s injurious—neither are true,” he says. “Any exercise performed with poor form represents risk, but one thing is certain—a CrossFit athlete and regular WOD participants are amongst the fittest and healthiest individuals engaging in exercise programs. That is true,” according to Moretti. Does it sound appealing? Or at least interesting? Before committing to a membership, you can participate in a group CrossFit workout for a drop-in fee of around $25 at most CrossFit boxes. Each participant is expected to perform the same set of exercises to the best of their ability. A CrossFit session can be inspiring, challenging and will definitely push you to do things you may never have dreamed possible, but it may injure you, too, or at the very least, leave you feeling completely drained and nauseous. But until you try it, you'll never know.